Remove husks from corn. Cut kernels from corn to make 4 1/2 cups. Reserve 1 1/2 cups kernels for filling. Heat oil in large skillet over medium heat until hot. Add onion and garlic; cook 2 to 3 minutes. Add chile and 3 cups of the corn kernels; cover and cook 4 to 6 minutes or until corn is tender, stirring occasionally. Cool slightly. In blender container, combine milk, salt and corn mixture; blend until coarsely pureed. Set aside. Heat oven to 350°F. Spray 13x9-inch (3-quart) baking dish with nonstick cooking spray. In large bowl, combine reserved 1 1/2 cups corn kernels and all remaining filling ingredients; mix well. In small skillet over low heat, heat each tortilla until softened. Place about 1/2 cup filling on each warm tortilla; roll up and place seam side down in sprayed baking dish. Top with corn sauce; sprinkle with 1 cup cheese. Bake at 350°F. for 20 to 25 minutes or until thoroughly heated. Just before serving, sprinkle with cilantro. To cut kernels from an ear of corn, hold the ear upright inside a shallow bowl. Use a sharp knife to cut right where the kernels meet the cob, cutting down the length of the ear. Rotate the ear of corn, and keep cutting off kernels and rotating the cob until all the kernels are removed. Corn kernel removers are sold at cookware stores. 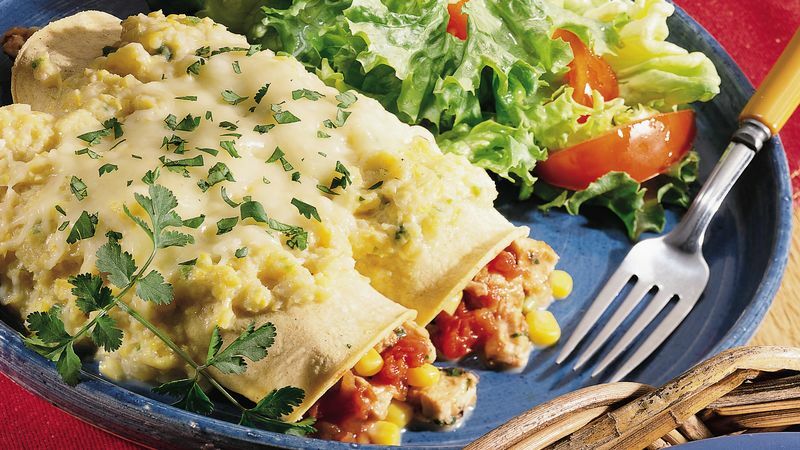 To make Corn and Bean Enchiladas, omit the chicken and add a can of drained pinto, black or kidney beans to the filling mixture.